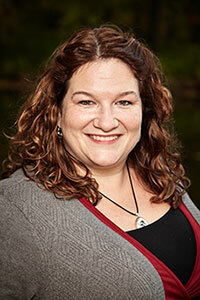 Dr. Wilkinson is an assistant professor in the Department of Occupational Therapy. Bio: I was lucky enough to discover the world of occupational therapy when I was a high-school student. I completed my bachelor's degree in occupational therapy at the University of Buffalo and worked primarily in pediatric practice settings for 13 years before entering full time teaching. During that time, I worked with families in California and New York in settings that included home-based early intervention, hospital-based pediatric mental health, clinic based sensory integration, and home and clinic based DIR/feeding work. I completed my MA and PhD in Occupational Science at the University of Southern California where I was a member of research teams that investigated health-care disparities for African American families with children with special needs and did my dissertation research on mothers' perceptions related to feeding a child with an autism spectrum diagnosis. Teaching: Here at Ithaca College, I teach classes related to research and pediatric practice. In the fall, I teach Applied Pediatric Neuroscience to Masters level students. As part of that course, I started a play and feeding group for children with special needs where OT students get hands on experience working with children with differences and the kids get a chance to play and share a meal in a supported environment. In Quantitative Concepts for Professional Reasoning, I work with students to develop their ability to read, use, and create quantitative research related to the health sciences. In the spring semester, I co-teach the Pediatric Evaluation and Intervention course with Amie Germain where Senior level students work to develop their evaluation and intervention skills for working with children. Through-out both semesters, I support a group of 8-10 masters level students in creating and carrying out a research project for our Group Research I & II Sequence. This last year we surveyed pediatric occupational therapists about their use of play that involves risk taking and outdoor play. Research: Through the Group Research I and II classes and in individual thesis projects I've worked with students to research topics related to parenting children with special needs and mother's perceptions related to their children's eating. After the birth of my own son, my research focus broadened to include a topic that had frequently come up in my analysis of parent interviews and was now at the center of my own thoughts about parenting. I began to see how crucial understanding the benefits of free play for children's development was and how much our current cultural norms suppressed opportunities for young children to play freely both indoors and out. My current research is focused on exploring how children's outdoor play can be understood through an occupational therapy lens and advocating for play opportunities that are accessible to all children. I collaborated this year with a group of local school administrators, parents, and a community group on a project called Reimagining Recess! which brought loose parts play materials, a shed to store them in, and specialized training to the recess environments of two elementary schools in order to expand opportunities for different types of play that children can engage in during their school breaks. Dr. Wilkinson lifts a colorful sheet placed on a cardboard box for a child to crawl under during a lab focused on "loose parts" play.